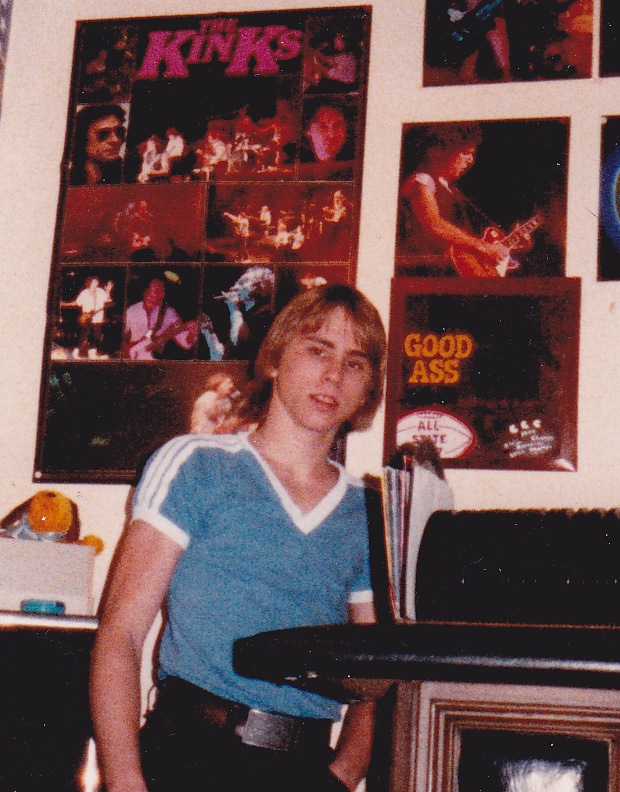 Gary rockin’ in his room, trying to look tough. I am going to delve into my past and tell you a very well-kept secret. I don’t know that I have ever shared this story with anyone. A few of my high school friends and family may know about it but it hasn’t been spoken of since 1983. I have been married more than once, and the first time I was very young, seventeen to be exact. Many say that is too young. In most cases, they would be right. But not this time, even knowing what I know now, I wouldn’t have traded that experience for all the riches of the world. In 1982, dressed in flash dance fashion, I met a guy. I’d seen him around, he was friends with a friend of mine. I’d had a crush on him since I was a freshman. He didn’t know I was alive, or so I thought, until one night outside of a convenience store, three years later. I was acting out and being stupid, I was finally a senior and had no idea what the future held for me. Blond and bouncy, he was full of life and energy; he wanted to be a rock star and played a sweet vintage Gibson Les Paul guitar. He was unlike anyone I had dated. He wanted to be wild, but he was too good for the wild life. It was love at first sight and he changed my life forever. As with most teenage love stories, we were instantly inseparable. He was like oxygen and if he wasn’t near I couldn’t breathe. Being your typical teenager, I had to push the limits, one night in March, I broke my 10:30 p.m. curfew. Yes, that’s right, 10:30 p.m., not 11, not midnight, 10:30 (and kids now think they have it rough). My mom, in true parental fashion, deemed my punishment was no phone, no outside contact. I was only allowed to go to church and school (which was right across the street from my house and the family business), for 6 months! I thought my world had ended. As any warden would do, my mom allowed me one last phone call. In that phone call, two young lovebirds began to hatch a plan. Gary and I would see each other at church, but since he had been a senior when I was a freshman, that would be our only contact. I couldn’t wait to go to church on Wednesday and Sunday. During Bible class and service Gary and I sat together and whispered or passed notes. In a Bible study on a note passed between us, he asked me to marry him. I couldn’t react; I could only nod my head and sniffle to keep from crying. I was thrilled, and that made the punishment seem all the more unbearable. I knew my mom would never let me get married, I was seventeen. I had already been accepted at the Art Institute and we were planning a bright future. I didn’t see why marriage had to put an end to that. I knew Gary was meant to be in my life. There seemed to be such a feeling of urgency about it and I knew that if I went away to college alone, Gary and I would never be together. To the very core of my being I knew I had to do this. Now I know it was God winking at me, but then, I prayed and I cried and Gary and I covertly began planning an elopement. From the moment I met Tracy I felt at ease with her, I could tell her anything and she would understand. I think Gary and I spent more time at her house than we did anywhere else. Tracy married her high school sweetheart Tim at around the same age. She understood the sway of young love and believed in its power. To this day, I believe she felt the same sense of urgency I did. She was always in Gary’s corner, and would do anything for him. Tracy was instrumental in helping us concoct a plan to run away together. She was a great planner, too. She told us how we could go across the border to Jellico, Tennessee and get married; we just needed copies of our birth certificates and to get a blood test. We put the plan in motion. She and Gary took the day off from work and I skipped school. Let me tell you, skipping school when you live right across the street is no small feat! 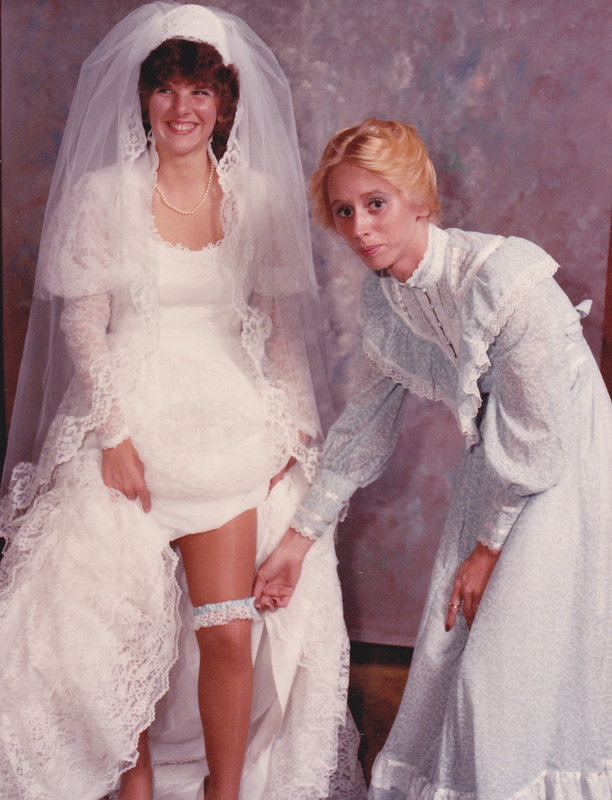 Tracy helping me with my garter. 2nd wedding we had planned. Tracy drove because we were so nervous. We got our blood test, (back then you had to do that) and we headed to the courthouse. Well because I was underage, and Tracy couldn’t pass as my guardian, the covert operation failed. We were all devastated. I had to go home as if I had come from school and act as if nothing had happened, but I couldn’t stop crying. As soon as I got home I went to my room and closed my door. My mom came to see what was the matter and when I couldn’t quit crying I had to tell her what had happened. I was scared to death, but I figured the punishment couldn’t have been much worse than what I was feeling already. I told her how I felt and the way I felt without him. We talked for a long time. I told her about the proposal the sense of need I felt. There were lots of questions. With every answer, she could see my resolve. I assured her that I would still attend art school and that I was certain of my feelings. Then, I took a deep breath and then I told her what we had tried to do that day. She was shocked speechless for a few minutes. As I sat there in the silence, I prayed she wouldn’t kill me. Amazingly, she was much more understanding than I would have ever imagined. She told me if I finished high school and stayed on task for art school that she would give me her blessing and we could start planning a wedding in July. I was so thankful that God had made a way where I saw no way and had given me this opportunity. My first call was to Gary, but my next call was to Tracy to ask her to be my Matron of Honor. Through it all, Tracy gave me the courage to stand up and fight for what I believed in, to step out on faith and I will be forever thankful. Gary and I were married on July 16th, 1983. We were only married for two years and eleven days before God called him home. Our time here may have been short but it was priceless. Gary and Tracy taught me to be strong, stronger than I ever realized I could be. Gary died 27 years ago. This year he and much of his family welcomed Tracy at the gates of heaven.